Here at Adjust Your Health Chiropractic and Massage Therapy, we believe managing your whole-body wellness is essential to living a healthy, happy life. Whether you suffer from chronic stress or occasional stress, finding ways to manage mental and emotional strain can help you relieve and control the physical manifestations of stress. Today, we’ll pick up where we left off last time and continue exploring the secrets to relieving stress. If you have questions or want to schedule an appointment for chiropractic care, acupuncture, or medical massage, contact your Top Rated Local® chiropractor in Overland Park! Here are a few more ways to relieve stress and anxiety so you can live your best life! There are many natural supplements that can help reduce stress and anxiety. Herbal extracts like lemon balm have anti-anxiety properties that promote relaxation and enhance mood. A study published by the National Center for Complementary and Integrative Health reports that omega-3 fatty acids have shown promising results for reducing anxiety and inflammation in healthy young adults. Green tea also contains compounds that can improve mood and reduce stress. Talk to your chiropractor about these and other natural supplements that can reduce stress and anxiety. There is something incredibly soothing and calming about an aromatic candle and the warm glow it emits. Lighting candles is a great way to relax and unwind after a busy, stressful day, especially candles that have natural scents formulated specifically for promoting relaxation. In addition to candles, essential oils have been relied on by cultures throughout the world for centuries to relieve stress and anxiety, encourage relaxation and calmness, and enhance meditation. Essential oils like lavender, sandalwood, rose, bergamot, neroli, and Roman chamomile emit calming aromas that can help you relax, rejuvenate, and refocus. Add a few drops to your nightly bath or run an essential oil diffuser at your desk, in your bedroom, and in your living room to relieve stress. Keeping a journal is a great way to express your feelings, thoughts, and emotions through writing. Journaling allows you to express your inner feelings without any judgments. It is also an excellent way to jot down your goals and set intentions while keeping track of them. The simple act of writing is also soothing and calming. Limiting the amount of caffeine you consume daily and even weekly can have a positive effect on your body’s response to stress. Cutting out coffee, in particular, has been shown to decrease stress and anxiety levels. Even if you can’t cut it out completely, reducing how much caffeine you consume could make a big difference in your stress levels. Electro-acupuncture (acupuncture without needles) can tap into the energy meridians located throughout the body to improve energy flow, ease stress, alleviate anxiety, reduce muscle tension, and lower stress hormone levels to regulate emotions, mood, and the body’s reaction to stress. Talk to your chiropractor about implementing acupuncture for stress management into your wellness care. In addition to the common stress triggers we mentioned at the beginning of the post, pain is another trigger for stress. The problem with pain is that it also contributes to the vicious pain-stress-pain cycle of experiencing pain as a result of stress, and vice versa. 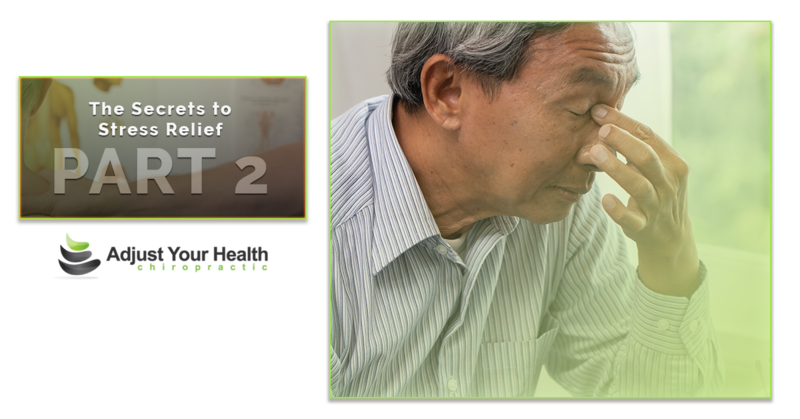 By targeting and treating the cause of your pain, you can experience longer-lasting relief, which can eliminate this cycle. Routine chiropractic care, scheduling regular massages, and incorporating electro-acupuncture into your wellness regimen can help reduce stress, tension, anxiety, and pain. Reach out to Adjust Your Health Chiropractic and Massage Therapy to schedule an appointment for wellness care and experience the benefits of stress relief for your whole-body health and wellness. Please feel free to reach out to us with any questions or to schedule a consultation to discuss your specific concerns. Call us at (913) 681-7757. Thank you for reading!